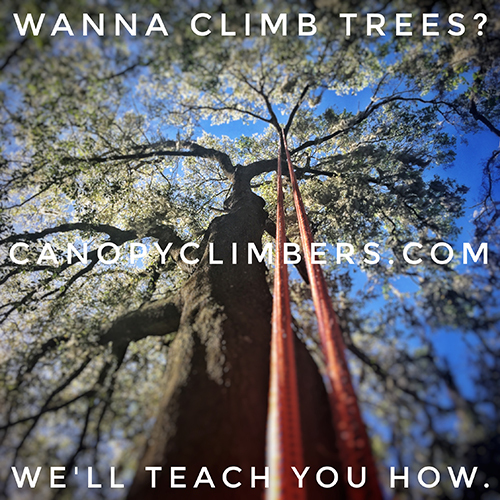 Canopy Climbers LLC - Experience The Adventure of Climbing Trees! 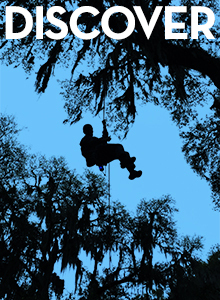 The Basic Tree Climbing Course (BTCC) provides the bedrock of knowledge for technical tree climbers. The 2-day tree-climbing course is designed to teach you the necessary skills to climb big trees on your own safely, confidently and proficiently. You’ll learn how to create and climb the "Doubled Rope Technique" (DRT) arborist rope and saddle climbing system. Become a skilled tree-climber. 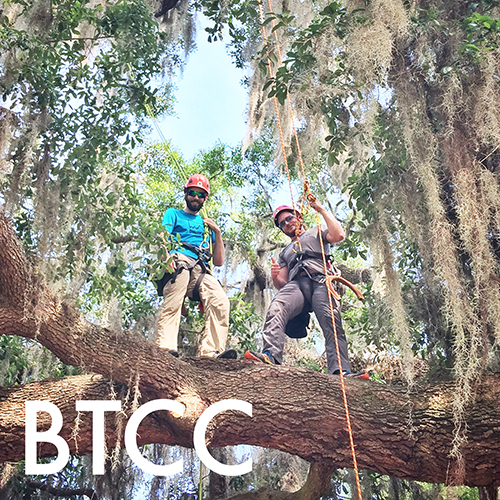 Take the BTCC in Gainesville with Tree-Climbing Instructor Danny Lyons. You'll learn to safely and skillfully climb trees and achieve the ability to "mobilize" through the forest canopy. This isn't just climbing up and down on a rope. This is mobilization, vertically and horizontally, traversing through the treetops. After you complete this course successfully, you'll be ready and able to purchase your own gear and climb trees safely. This course is ideal for anyone who wishes to safely access the forest canopy. No previous tree-climbing experience is required to take the BTCC. However, please be advised, this course is an intensive, 2-day tree-climbing experience and is physically and mentally demanding. Our classes are small and limited so students get constant supervision by the instructor. PLEASE NOTE: If you are clilmbing solo, no problem. We will try to match you with other students to create a 2-3 person class. Or, if you already have 2-3 people total in your party, then we can schedule a class at your convenience. The BTCC must be scheduled over 2 consecutive days. - Extensive practice of all skills to build "muscle memory"
- You'll learn Double Rope End Climbing skills, known as DREC, that will allow you to mobilize through the treetops. -	Ask how we can add an additional day to your BTCC for you to take the Hitchclimber Workshop. See below for more information. Beyond the Basics (BTB) is a tree-climbing course that is designed to help you build upon your BTCC. You looking to sleep in the crown of a big tree? This course teaches you more advanced climbing techniques, lanyard work, how to limbwalk safely and haul your camping gear into a tree. 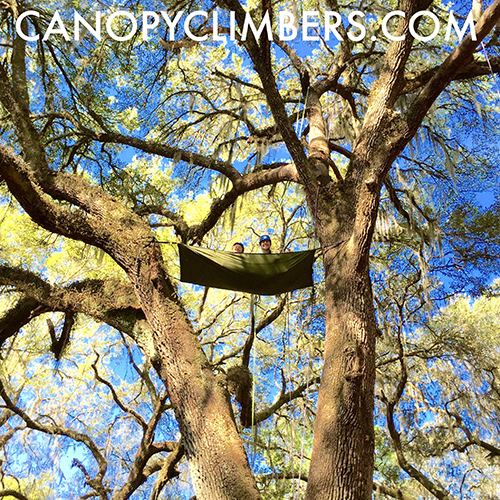 You'll learn how to set up a Treeboat Hammock in the treetops. We take canopy-access to the next level by introducing you to the Big Shot. And you'll learn how to set up for a long-range traverse, from one tree to another, all from the canopy. This course is the next step for anyone who has already taken the BTCC, and wants to enhance their tree-climbing skillset. Much like the BTCC, this course is an intensive, 2-day tree-climbing experience and is physically and mentally demanding. PLEASE NOTE: If you are clilmbing solo, no problem. We will match you with other students to create a 2-3 person class. Or, if you already have 2-3 people total in your party, then we can schedule a class at your convenience. The BTCC must be scheduled over 2 consecutive days. Interested in taking the BTCC or BTB? Do you already have two people in your party who want to take the course? Then you already have a class! Our courses require at least 2 students, but no more than three. Simply EMAIL US to schedule the BTCC today. If you're interested in taking the BTCC and you're climbing solo, then no problem. We'll find a classmate or two for you. Simply click the button above and complete a quick "Classmate Finder Form." This form will be automatically emailed to us and we'll begin the search for 1-2 classmates to join you for your BTCC. This is a 1-day, Canopy Climbers tree-climbing course that introduces students to the unique and efficient Hitchclimber DRT system. Students learn how to create and climb on this remarkably versatile, self-advancing climbing system. 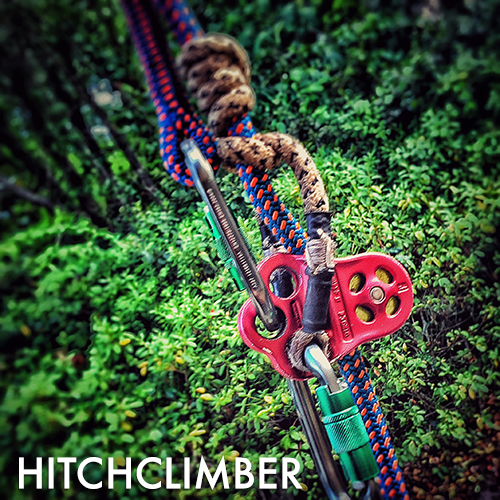 Proficiency of the Hitchclimber DRT system is also beneficial for tree-climbers who plan to eventually learn to climb on the highly efficient Single Rope Technique (SRT) system known as "Singing Tree Rope Wrench." Consider combining this 1-day course with your Basic Tree Climbing Course, creating a high-adventure, 3-Day educational experience. - Students must be up to date on their tree-climbing fitness and be able to demonstrate a BTCC-level skill set. - You'll get extensive climbing practice on the Hitchclimber system to build "muscle memory"
All Content © 2019 Canopy Climbers, LLC. All photography by Danny Lyons unless otherwise credited. All Rights Reserved.